The use of alkaline materials (eg limestone (CaCO3)), quicklime (CaO) and, more recently, hydrotalcite (Mg6Al2CO3(OH)16·4(H2O)) to neutralise and control acid and metalliferous drainage (AMD) is a well-established global practice (Douglas et al, 2010). However, active treatment of AMD using these materials is costly. Alternatively, alkaline-rich industrial by-products, such as boiler ash produced by paper mills, could be used. Recent studies (Doye and Duchesne, 2005; Yeheyis, Shang and Yanful, 2009; Jia, Maurice and Öhlander, 2014; Mäkitalo, 2015) describe the application of pulp mill waste for AMD control by experimenting with waste rock and tailings. The success of the material as a neutraliser was dependant on its physical properties (eg plasticity; Mäkitalo, 2015) and chemistry (ie chromium, cadmium and copper content). Alternative uses for industrial by-products has the potential to be environmentally beneficial when used in AMD management, with financial advantages offered through decreased disposal costs and an additional revenue stream through the sale of ash (Yeheyis, Shang and Yanful, 2009). In Tasmania, there are approximately 4000 legacy mine sites, 215 of which pose an environmental threat through AMD risk (Pepper, Roche and Mudd, 2014). A cost-effective, environmentally sustainable method of AMD treatment is needed. 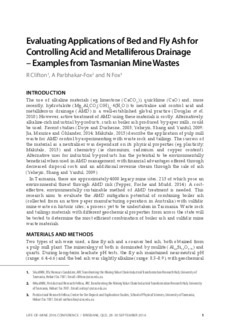 This research aims to evaluate the AMD mitigation potential of combining boiler ash (collected from an active paper manufacturing operation in Australia) with sulfidic mine waste on historic sites; a process yet to be undertaken in Tasmania. Waste rock and tailings materials with different geochemical properties from across the state will be tested to determine the most efficient combination of boiler ash and sulfidic mine waste materials.